She may not have had any of her children with her, but Angelina Jolie made sure she led by example while directing scenes for her latest movie in Australia. The actress made sure she protected her fair skin from the strong sunlight while shooting Unbroken in Queensland on Tuesday. The Hollywood star, who has three daughters and three sons with fiance Brad Pitt, sheltered under a large wide-brimmed hat. The actress was spotted chatting to the film's crew in front of a large blue screen, after scouting for locations last week. The 38-year-old was dressed casually in an all-black outfit which displayed her tiny arms and shoulders. 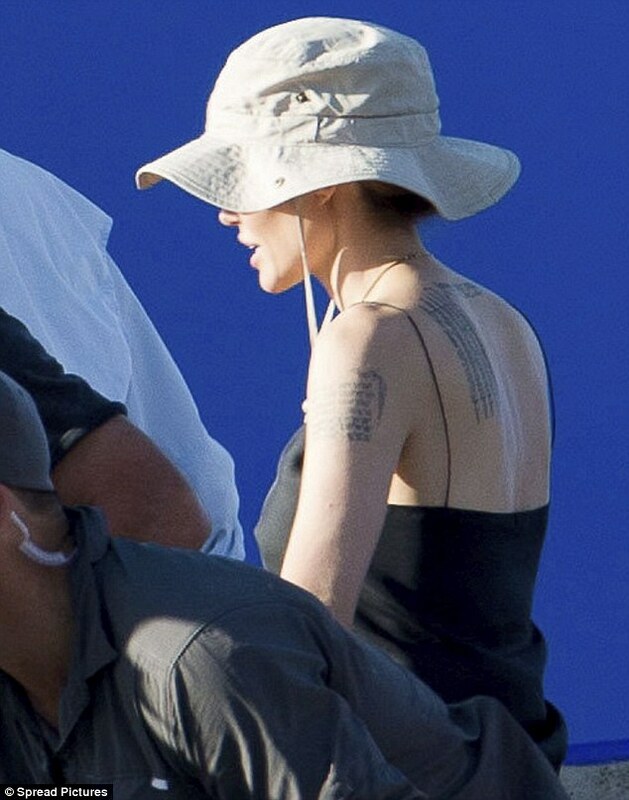 Wearing a strappy top, Angelina's numerous tattoos were visible on her upper arms and back, which include the geographical co-ordinates of the birthplaces of all her children. While spending time in Australia, the star has become a fan of hats and she was recently pictured wearing a wide-brimmed black number. The brunette beauty appeared to be wearing very little make-up while her long locks were hidden under her rather uncool headwear. The star sparked more marriage rumours by wearing a new gold band on her wedding finger last week, which was first seen earlier this month. Her latest movie is based on the book Unbroken: A World War II Story of Survival, Resilience, and Redemption, by Laura Hillenbrand. The biopic follows the life of American Olympic runner Louis Zamperini who was captured by the Japanese military. 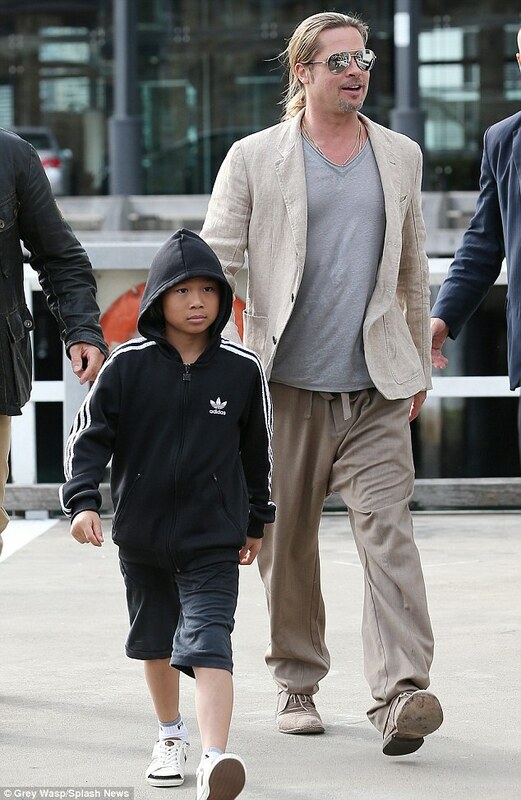 The actress is not the only member of the Jolie-Pitt clan who has been spending time Down Under recently, as Brad flew into Sydney on Tuesday with their son, Pax. To promote his latest film World War Z, the actor has been trotting the globe, gifting fans with his presence at screenings for the new zombie epic.